Can Data Science and Big Data Improve Design? Let us seize this moment for Data Science, and let us never forsake this invitation to be better designers. A question for Designers and Data Scientists alike: Can members of the latter empower representatives of the former? Which is to say, can design – a discipline dependent on the artistic ability and the qualitative skills of a given person – become better and more effective, because of the quantitative knowledge of a specific group of experts? Can, in other words, Big Data improve design and create a greater emotional response among consumers? The answer is: Yes. Big Data can reveal certain preferences, and confirm the numbers behind those preferences, involving why people like sites that have, say, a particular aesthetic and a distinctive layout. While that information will not transform you into artist, and though that material will not bless you with an intuitive eye for how to draw, sketch or paint, it will make an already talented Designer a more effective user of this digital domain of creativity. For we now have the chance to see the reasoning behind the popularity of an inherently visual medium like the Web. We have the intelligence to separate what works from what does not, so we can marshal design to drive more business, and increase sales and profits. We have the opportunity to make design more scientific, which means we have the chance to make the application of science more appealing to the public at large. This material makes a Designer’s job easier – it makes the duties of my Designers simpler – because it removes the guesswork that can all too quickly cost a company considerable time and money. It absolves a Designer of the attempt to divine what people want, based on nothing more than one individual’s subjective belief in this or that concept versus something different. In that scenario, the one where a Designer is not privy to data, a business can have a beautiful site that repels more than it attracts; that (unintentionally) rejects the wants of viewers and the needs of consumers; that is cause for alarm, not celebration, because its looks belie its performance. Again, the best way to avoid that situation – and the best way to prevent a repeat of that sequence of events – is to analyze the data at your disposal. Examine this content for your own edification, as well as your own appreciation for the power of design in general. Remember, too, that design is one of many important parts. Meaning: A site that is the manifestation of the accurate interpretation of data is a good thing – a necessary thing – but it is not the only thing a business needs. Without excellent customer service, targeted marketing and a superior product, no amount of great design can suffice for the absence of these other things. And yes, data underscore these facts. It should be the job of every Designer to use data to fulfill the requirements of a project; and it should be the aim of every Data Scientist to make design a priority on behalf of every assignment a client wants you to oversee. This union between data and design signifies a new era in brand identity, customer outreach, marketing and communication. With design driven by data, and with sites designed to maximize data, we can have executives with greater insight, companies with greater intelligence and a workplace with a greater sense of wisdom. We should welcome the arrival of this milestone, since it marks yet another triumph for data and an additional victory for clarity – of design and purpose. Let us seize this moment for Data Science, and let us never forsake this invitation to be better designers. 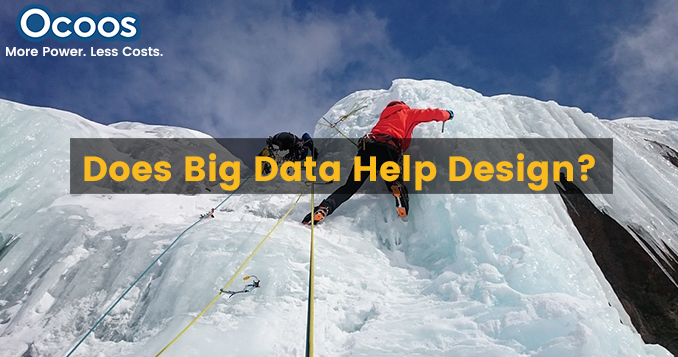 Industry Trends and Analysis : Can Data Science and Big Data Improve Design?